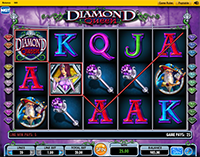 Welcome to the magical Queendom presented in IGT's, Diamond Queen slot online, a 5-reel 20-payline machine. The beautifully illustrated free slot features some great really amazing gameplay coupled with colorful game symbols and the exciting Mystical Diamond Free Spins Bonus! Welcome to the magical Queendom presented in IGT’s, Diamond Queen slot online, a 5-reel 20-payline machine. The beautifully illustrated free slot features some great really amazing gameplay coupled with colorful game symbols and the exciting Mystical Diamond Free Spins Bonus! With 20-paylines, the Diamond Queen slot is relatively low variance which means you’ll be hitting a lot of smaller sized wins instead of a few large wins. The games symbols on the reels include the standard Ace, King Queen, Jack and Ten symbols, as well as the more themed Crown, Wizard, a map, the Diamond Queen logo and the Mystical Diamond, which is the bonus symbol. You might also strike the Wild Symbol which will substitute for all other symbols to complete winning combinations when possible, except for the Scatter symbol. Triggering the Mystical Diamond Free Spins Bonus means that you are about to embark on a Free Spins round that could land you huge winnings. Hit 3 of the identified symbols anywhere on the center three base game reels to be awarded 3 Free Spins in the Round. The Mystical Diamond Free Spins Bonus Features guaranteed Locked Wilds and Stacked Symbols and this is where wins start to get interesting. Reel 2 can start off entirely wild, with reel 3 eventually becoming entirely wild alongside Reel 2, and then finally Reel 4 becomes entirely wild as well joining the crowd and giving you gigantic wins!